In January, we had Robert as our demonstrator. 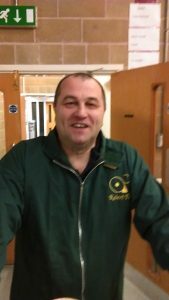 He greets from Stafford and has been turning wood for a long time. 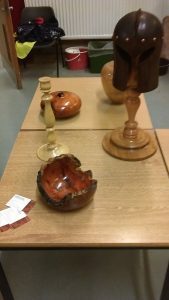 His demo focused primarily on birds houses and bird feeders, both items that generally sell well at craft fairs, are fun to make for both the experienced and the less experienced, and do not require expensive materials or special tools. 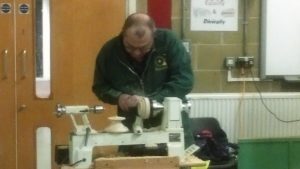 The typical bird house can be made from many different types of wood, for this evening he had brought along some pieces of part seasoned sycamore, some with a little bit of spalting starting to develop, and in various stages of progress. The main body is about 4-5″ diameter and about 9″ tall (obviously this can be adjusted to available timber within reason), and a second piece is required for the lid, approx 1″ wider in diameter and 3.5″ tall. Depending on the method chosen for mounting the pieces, extra timber needs to be added to the length to account for tenons. 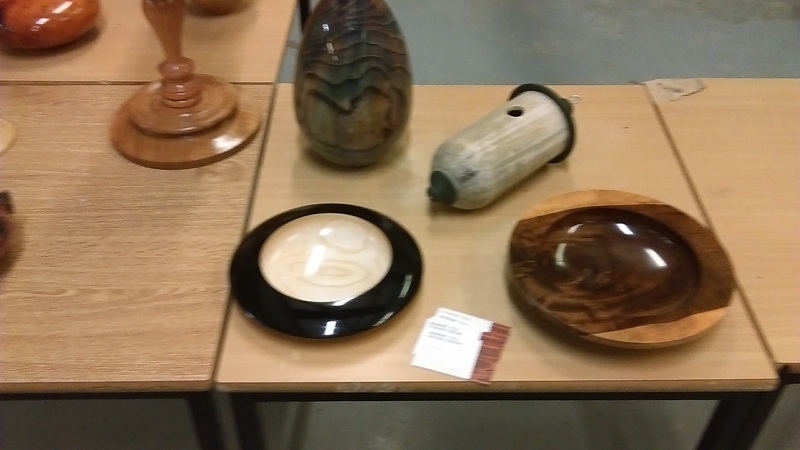 Robert started out with a piece that had been turned into a round cylinder, but nothing else. He put it between centres, skimmed it to ensure roundness and turned a tenon on one end, so he could it in the chuck. Once mounted in the chuck, a hole was drilled down the centre to approx. 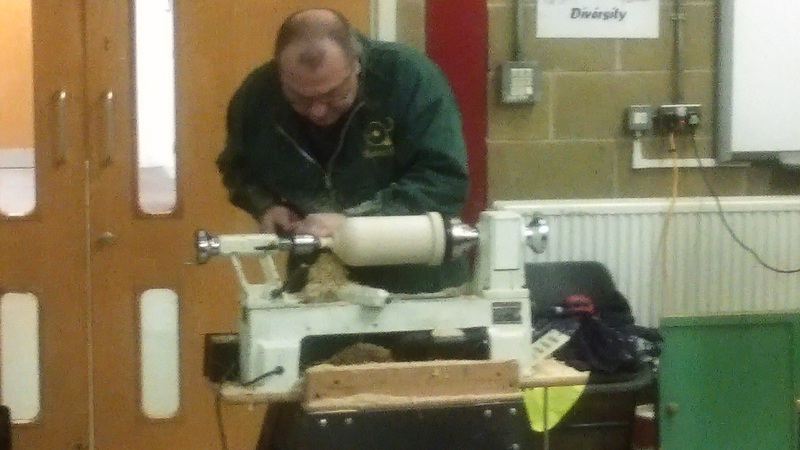 the depth required, and he started hollowing the cylinder, always taking time to explain the various cuts and tools used. Since hollowing is not the most attractive work to demonstrate, this item was then swapped out for one that had been hollowed already. Robert made it very clear that the only chance of success with partly seasoned wood is by keeping the wall thickness even from the top right down to the bottom, otherwise one should expect cracks to develop during the final drying. He then turned a shoulder into the top of the bird house body, where the wall thickness is reduced from 6mm to 3mm, and finally proceeded to turn the foot of the body, where it gradually tapers into a point. A very important bit is the drain hole at the bottom, about 5mm in diameter, which ensures that any moisture can escape safely. Robert did not do any sanding during the demo, but mentioned that the finish on these bird houses is very much left to the individual maker, but one should seek advice about suitable finishes from relevant organisations (clearly some lacquers or oils would be at the least an irritant to the future occupiers and at the worst a health hazard). The entry hols for the birds should be positioned at least 120mm above the foot (apparently that’s a safe distance where cats cannot reach inside), and its diameter has an influence on which birds can enter. The lid was turned in similar fashion, with a lip protruding into the shoulder in the bottom part. This is where the two are eventually joined together with a few screws. Again, wall thickness has to be even to prevent cracking, and decoration is left to the individual. Towards the end of the evening, a little bit of time was left, which was used to make a bird feeder to go along with the bird house. Made from a similar size piece of timber, the bird feeder has a domed roof, rounded bottom and a recess for the feed. Turning the recess is initially done with a standard spindle gouge, but in order to achieve substantial depth the use of a hollowing tools is required.